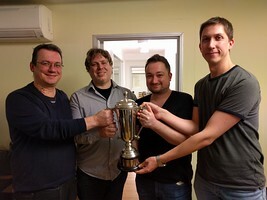 The National Point-a-Board Teams has been won by the team of Neil Rosen, Kieran Dyke, Mike Bell and Michael Byrne (pictured, from left to right). They finished just 1 point ahead of Alan Mould, John Holland, Sally Brock & Barry Myers, with Graham Osborne, Frances Hinden, Jeffrey Allerton & Chris Jagger in third. The consolation final was won by Ankush Khandelwal, Ben Green, Ben Norton & Stefano Tommasini.